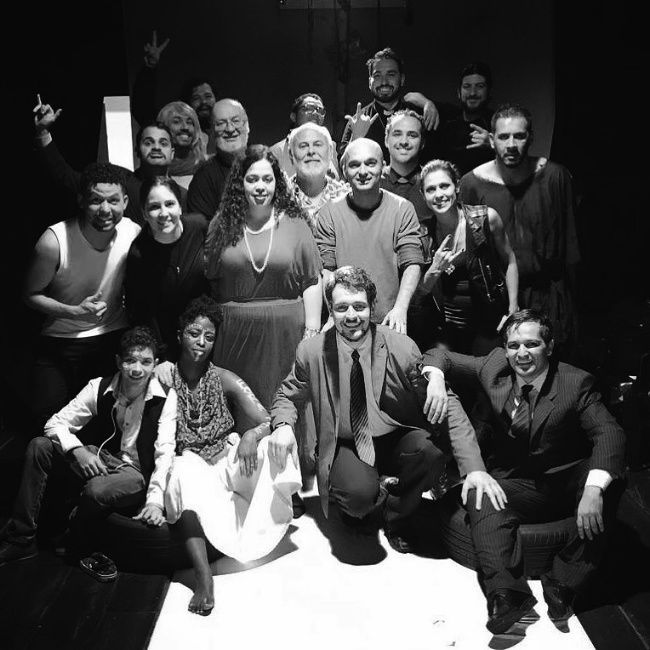 Our performance of Chico de Assis’s play Missa Leiga at the Teatro Escola Macunaima in São Paulo, Brazil was the result of a collaborative process with students in the school’s actor training program. The work resulted in a spectacle that scrutinized all forms of religion and protest, trying to revive the premises of Chico de Assis’s play. Chico de Assis, who was born Francisco de Assis Pereira in São Paulo in 1933, was a writer, teacher, screenwriter and playwright. He is considered one of the most important and admired gures in São Paulo culture. The playwright was part of the first generation of the Teatro de Arena, which was at the forefront of experimental and social-conscious theatre in Brazil in the 1950’s and 60’s. As an actor and writer, he wrote successful tv shows such as Ovelha Negra (1975), Xeque-Mate (1976), Cinderella 77 (1977) and Salário Mínimo (1978). He was part of the famous, left-wing Centro de Cultura Popular that undertook revolutionary art until the group was successfully repressed by the government in the mid-Sixties. With Carlos Lyra, he wrote “Canção do Subdesenvolvido,” “The Song of the Underdeveloped,” a popular activist song prohibited during the military regime, from the mid-Sixties to the mid-Eighties. Ademar Guerra first staged Missa Leiga in 1972, and the play was subsequently performed in Portuguese-speaking countries such as Portugal, Angola, and Mozambique. Chico also wrote screenplays for films such as Nelson Pereira dos Santos’s Na Estrada da Vida and Jeremias Moreira Filho Fuscão Preto. Chico de Assis helped found the Arena Dramaturgy Seminar and the Interpretation Laboratory. Facing the incomprehensibility of humanity, Missa Leiga reflects on the fate of the world and of humanity as well, through a great prayer. The arrangement of scenes follows traditional parts of the Roman Catholic Mass and addresses issues, above all, of human responsibility. Fear and a desire to escape challenge humanity’s real understanding of God, the universe, human relationships, and the world. Missa Leiga urges a reassessment of the individual’s role in society and also criticizes the human capacity for self-destruction. Working with a play so pluralistic as Missa Leiga at a time when freedom is under threat in Brazil—and in a time when religious intolerance still makes victims in all parts of the world—was a challenge that fed the soul, and it was above all a necessity of art. The aims of this work were to touch on the sensitivity of the audience and to raise a debate about living in society. 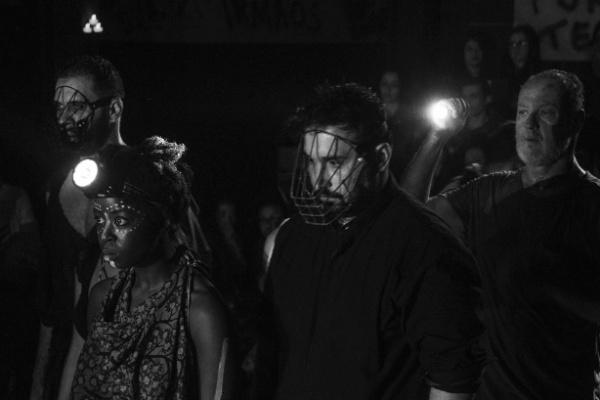 Bringing to the stage of the Teatro Escola Macunaíma a work that approaches the cry for religious freedom—for the need to respect not only human relations, but especially the human being in all individuality and choice—made evident analogies with this dark time in which we are immersed. The choice of text was based on the need to present to the group some concepts of Brecht’s epic theater, in addition to the work of Chico de Assis, in order to broaden students’ perspective on our culture and on the system of Constantin Stanislavski, work methodology that is defended at the Teatro Escola Macunaíma. The structure of the spectacle was derived from the structure of a Catholic mass. This suggests the idea of sharing the sacred human body with the audience—a body that lives in a state of doubt and indignation, which questions its own faith in order to try to find some truth in the possibilities offered by the harsh reality of the world. Although it mimicked a Catholic mass, it was ministered by the actors/characters. It was a lay mass. There was no priest, and all had the word, guided by a chorus that recalled Greek tragedy. The chorus conductor opened the way for other voices to be heard. In this sacred space of the mass, which can also be the sacred space of the theater, the assembly became free to pose its questions. The original text and the staging did not seek the exaltation of Catholicism, or other religion. It sought, rather, an artistic and social space, where the dialogue between people could be established. Teatro Escola Macunaíma is a Drama school that was founded in 1974 by actress Myriam Muniz, director Silvio Zilber, and costume and set designer Flávio Império, renowned artists whose names are connected with crucial institutions in the history of Brazilian theater—TBC, Teatro de Arena, and Teatro Oficina. Currently, the school is managed by director Luciano Castiel, who remains linked to the initial ideology of the school, maintaining a body of professors trained in the best universities and having extensive performance experience. Reginaldo Nascimento is an actor and director who founded the Teatro Kaus Cia Experimental in 1998. Since 1993, he has been dedicated speci cally to directing and group theater research, having directed more than 20 productions, including A Palavra Progresso na Boca de Minha Mãe Soava Terrivelmente Falsa by Matéi Visniec, Marat Sade – Perseguição e Assassinato de Jean Paul Marat by Peter Weiss, Hysterica Passio and O Casal Palavrakis, by Angelica Liddell, O Grande Ceremonial by Fernando Arrabal, In éis by Marco Antonio de La Parra, A Revolta by Santiago Serrano, El Chingo by Edílio Peña, Pigmaleoa by Millôr Fernandes, Cala a Boca Já Morreu by Luis Alberto de Abreu, A Boa by Aimar Labaki, Vereda da Salvação by Jorge Andrade, and Homens de Papel and Oração para um pé-de-chinelo by Plínio Marcos. While working with Teatro Kaus, Nascimento edited two publications about dramaturgy and Hispanic language, Cadernos do Kaus – O Teatro na América Latina and Hysterica Passio. In August 2009, Nascimento organized with Teatro Kaus and the Instituto Cervantes the Um Certo Arrabal conference, an event that brought to São Paulo the important playwright Fernando Arrabal. Nascimento has been Drama Director in Teatro Escola Macunaíma since September 2010.